We are heading to Tullamore again, for the National Ploughing Championships – 18th – 20th September. Come and meet us and see our display of Electric Bikes. We are there to help and advise on the correct ebike for you, whether it be for fun, fitness, mobility, commuting, or commercial we have something to suit your needs. Looking forward to meet you, enjoy the fun. Increasingly, Electric Bikes are perceived as the efficient way to negotiate city traffic, especially in the dreaded morning and evening commute. The market leading system is Bosch. Come and checkout our wide range of Bosch powered eBikes at our showroom in Kilkenny. If you are considering an electric bike for recreational activities, fun with family, commuting or as a means of getting fit and healthy, we will help and advise on the bike to suit you. Tired of sitting in traffic in this stifling heat? Would you like to combine exercise with your commute? Look at this city ebike from Gepida……..
Can use the battery to assist with long distances or switch it off for a more intense workout………. Check out this great video from our friends at Gepida. 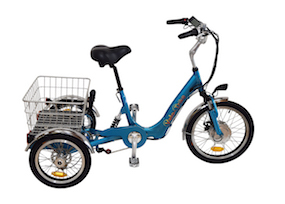 We have this eBike in our showroom in Kilkenny! Enjoy the scenery, get fit, have fun with the family, on the Waterford Greenway. The Waterford Greenway, ideal for electric bikes, is a spectacular 46km off-road cycling and walking trail along an old railway line between Waterford and Dungarvan. Ebikes are the largest growing segment in the cycling industry. The phenomenal growth of EBike sales worldwide looks set to continue. Driven by market leading systems such as Bosch, Shimano and Yamaha, the technology is constantly improving in areas such as reliability and range. We stock e-bikes for all different categories so it’s easy to find the most suitable one for you, for riding in the city, the country or on dirt roads.